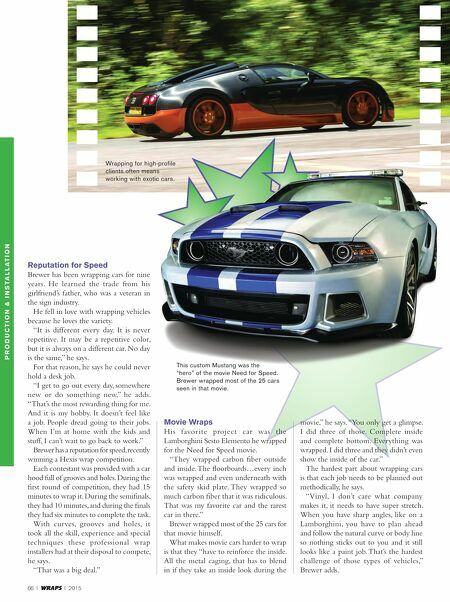 2015 I WRAPS I 67 Finally, older people with classic cars are realizing how fun car wraps can be, he says. "That's a good feeling. Yes, I was a little more excited for the older car. New ones are getting wrapped every day all over the country. It is not every day you get to wrap a Lincoln Continental that's in perfect shape," he says. It takes Brewer between six and eight hours to wrap the average vehicle, if he doesn't have to do door jams, but he and another wrap installer, Justin Pate, recently completed a speed wrap that was a full color change to a car, including door handles and mirrors, in well under two hours. "For anybody to become great at something you first have to mess up at something. It takes a lot of trial and error," he says. "I'm a very methodical person. I'll have a job planned out before I get there. I use sleep to plan out what I'm doing the next day. What could I do better? What would make it faster next time? What did I do last time? It is constantly improving. Even though I'm known for being one of the fastest, I am still improving every day." Wrapping a Classic He recently wrapped J.B. Smoove's 1968 Lincoln Continental, with suicide doors. Smoove is an actor and comedian who got his start on the TV series Def Comedy Jam. That project had "me pretty excited," Brewer says. The biggest reason is that most people are wrapping new cars. A simple color-change wrap takes on new meaning when you get to work on a supercar like the GTA Spano. The wrap needs to be perfect. 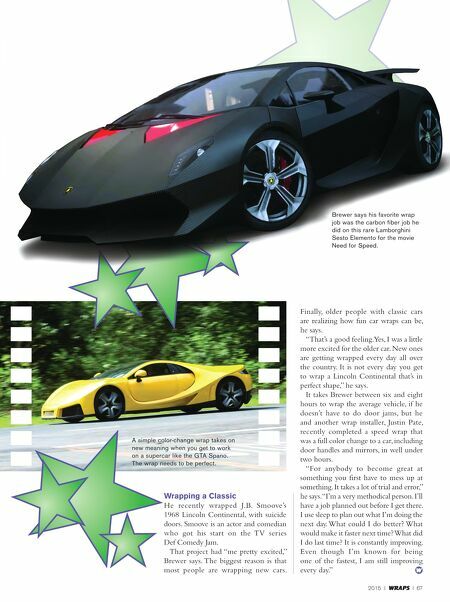 Brewer says his favorite wrap job was the carbon fiber job he did on this rare Lamborghini Sesto Elemento for the movie Need for Speed.